One of the most critical issues facing Canada’s environmental sector is the shortage of skilled labour. Increasingly, immigration has become a major source of filling this gap for Canada. 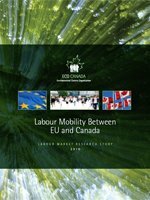 Labour Mobility between EU and Canada explores mechanisms to allow the Canadian environment sector to reach its full economic and employment potential in the global economy with migrant workers, including recent agreements to improve foreign credential recognition, facilitate international labour mobility, and strengthen the Canada-EU partnership.